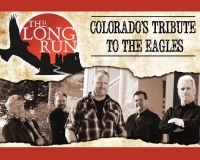 The Long Run, "Colorado's Tribute to the Eagles", is comprised of five of the busiest musicians on Colorado's Front Range. Laden with four and five-part harmonies, The Long Run reproduce the Eagles' hits with an organic 70's sound, accurate lead guitarists, multi-instrumentalists, and a lead-singing drummer. The band plays Eagles’ songs with haunting accuracy in which they faithfully and respectfully recreate. The Long Run has come a long way within their sound and music. The band has performed over 150 shows ranging from concerts, festivals, fairs, all the way to corporate and private events. Members of the band include Steven Weimeister (electric guitarist), Adam Rey (electric guitarist), Mark Trippensee (drummer), Bil Hopkins (bassist), and Reece Morse (keyboarder). Their original sound will have you humming “After the Thrill Is Gone” long after the show is over. This show always sells out, so be sure to get your tickets in advance!